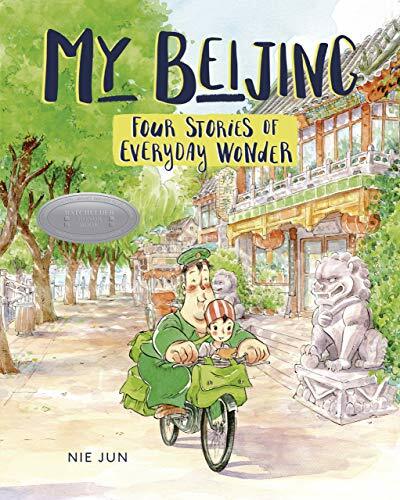 Whether you’re eight or eighty, My Beijing: Four Stories of Everyday Wonder is perfect for an afternoon of contemplating. What’s real? What’s a dream? What’s magic? The four stories give readers plenty of moments to use their own imagination. Nie Jun wrote and illustrated the stories in comic book style—but don’t be misled. This is not your father’s comic book of bold lines and dramatic primary colors (washed out by the printing process and cheap paper). This is a book of art. Each page presents multiple frames of the story, all done in pastel watercolors and ink lines. They’re rich in detail and action. The common thread through the stories is young Yu’er (Yu: fish; er: child) and her grandfather, who live in one of the many hutongs (a narrow lane or alley formed by lines of courtyard homes) of Beijing. Yu’er, the reader discovers in the first pages, can’t walk; however, the reader never discovers any additional information about her disability. While her inability to walk impacts the four storylines, it’s not the story. It’s a subtle touch. Yu’er is simply a child who, by the way, can’t walk. In the first story, her dream is to swim in the Special Olympics. When she’s refused entrance to yet one more swimming pool, her grandfather creates a “pool” for her—a harness that allows Yu’er to practice her strokes in the air. By the end, she truly swims through the air. It may be that she’s made her own luck or maybe it’s the dream of her grandfather. The reader can choose what to believe. In the other stories, Yu’er is saved from bullies by a boy who loves insects, discovers the early romance of her grandparents, and softens a cranky artist when she falls in love with painting. In each story, there may be a little magic or maybe a little time travel or maybe a little dreaming. It’s lovely to read the stories and not be bound by the here and now of the concrete world. Yu’er is both vulnerable and brave. Her grandfather is loving and wise. As she practices, he tells her, “. . . if you keep believing in yourself, you’ll make your own luck.” Kids will laugh when he’s occasionally a little silly, too. “Whenever Yu’er’s grandpa reached the middle of their neighborhood bridge, pedaling hard, he’d lift up his bottom and let out a giant toot. After that, the tricycle went as fast as lightning!” Let’s be honest. What second grader doesn’t love a good toot joke now and then? Along the way, Nie Jun’s illustrations gently immerse the reader in the everyday Beijing world. Neighborhoods, skylines, street scenes, and even the postal system and its collectable stamps teach the reader a bit about the country and culture without the reader even realizing it’s happening. An added bonus is that while many of the illustrations depict a quaint image of Beijing, Nie Jun also paints a real life city, one with abandoned wheelbarrows, sewer pipes ready to be laid, and cranes in the background. It’s not ugly. It just makes the city real. The simple vocabulary and short sentences make this perfect for a newly independent reader, and the brevity of words on a given page make it inviting for the reluctant reader. However, the implied dreaming or magic may confuse younger readers and would warrant a first-read through with someone older. Of course, kids may care less about the stories and just get lost in the beauty and detail of the illustrations. Does it matter? The engaging illustrations, exposure to the world of Beijing, timeless themes, and sweet characters make My Beijing a worthy addition to any library. It’s a keeper. Janelle Diller writes the Australia, Austria, and Mexico books for Pack-n-Go Girls Adventures. Her latest novel for adults is Never Enough Lilacs.